NewtonOne rocket motor test firing Jan. 14, 2014. Virgin Galactic has tested its new fleet of liquid-fueled rocket engines and unveiled additional details about the company's plans to use these hybrid motors to launch commercial satellites into orbit. 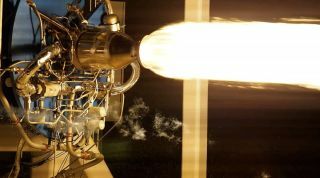 The engines, dubbed "NewtonOne" and "NewtonTwo," were test-fired last week, as part of an ongoing program to develop a new launch vehicle for small satellites. The expendable two-stage, liquid-fueled rocket, called LauncherOne, could make its first flights as early as 2016, company officials have said. NewtonOne, which powers the rocket's upper stage, is designed to provide 3,500 pounds of thrust. After dozens of previous tests, engineers last week fired the NewtonOne engine for five minutes, which is how long it will be fired during real satellite launches, according to Virgin Galactic officials. The larger NewtonTwo engine, which powers the main stage of the rocket, is designed to provide 47,500 pounds of thrust. The engine has previously been fired multiple times for short durations, and a longer test is expected to occur in the coming months, company officials said. Both engines were custom-designed and built by Virgin Galactic in Mojave, Calif., for the LauncherOne program. "The unique environment in Mojave enables the team to design, manufacture, assemble and test the engines in a single location, which allows us to make progress swiftly," Whitesides said. LauncherOne will be carried high into the sky by Virgin Galactic's huge WhiteKnightTwo airplane, then released to make its own way to orbit. WhiteKnightTwo also serves as mothership for the company's SpaceShipTwo space plane, which officials say should start making suborbital passenger flights later this year. The LauncherOne setup will enable Virgin Galactic to provide frequent and affordable flights to orbit, company officials said. "Our lives have already been improved immeasurably by satellite technology, but we can do so much more if we can bring launch systems into the 21st century," Whitesides wrote in a blog post on the company's website. "Satellites are getting smaller, smarter and lighter, but launches are as expensive, unreliable and infrequent as ever. We aim to change that and, by doing so, dramatically extend the user base and the scope and quality of satellite applications."